sourcing, logistics, quality control to successful market launch. Our key partner, AmRest Holidings SE, is the largest independent chain restaurant operator in Central and Eastern Europe. AmRest currently operates over 2000 restaurants in 26 countries. Since 1993 the company has been building a portfolio of well recognized, power brands such as KFC, Pizza Hut, Burger King and Starbucks. 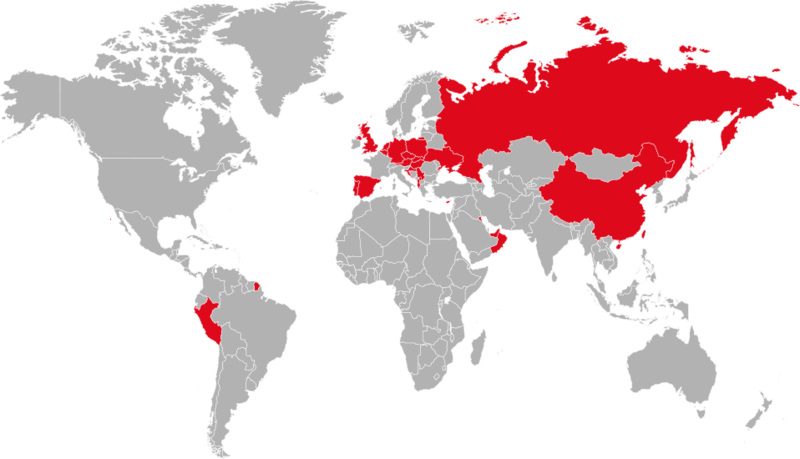 We cover more than 30 countries on 3 continents and continue to expand our area of operations. Europe: Poland, Germany, Spain, UK, Belgium, Netherlands, Portugal, Czech Republic, Slovakia, Hungary, Russia, Ukraine, Serbia, Kosovo, Croatia, Cyprus. South America: Grand Cayman, Guadalupe, French Guyana, Peru. Asia: Oman, ZEA, China. Complex logistics solutions, timely deliveries, Pan European reach. New products development, own Food Innovation Center, market trends analysis. Implementation of quality assurance systems and food safety protocols. Food products created to simplify the life of today’s consumers. Launching new products into the market, sales and marketing activities organisation.